Judge Lois Bloom visited Professor Tracy Higgins' Constitutional Law class. Judge Nicholas G. Garaufis visited Professor Nicholas Haddad's Legal Writing class. Judge Pamela K. Chen visited Professor Jed Shugerman's Torts class. Judge Ramon E. Reyes Jr. visited Professor Olivier Sylvain's Information Law class. Judge Eric N. Vitaliano visited Professor James Brudney's Legislation and Regulation class. Judge Ann M. Donnelly visited Professor James Kainen's Evidence class. Judge Joseph F. Bianco visited Professor Daniel Capra's Criminal Procedure class. Dean Matthew Diller (standing, far right) with judges from the EDNY. On January 31, judges from the U.S. District Court for the Eastern District of New York visited Fordham Law for a day in a residence. Eleven judges from the court joined Fordham Law professors in various classes throughout the day, including Torts, Criminal Procedure, Evidence, and Intellectual Property, among others. 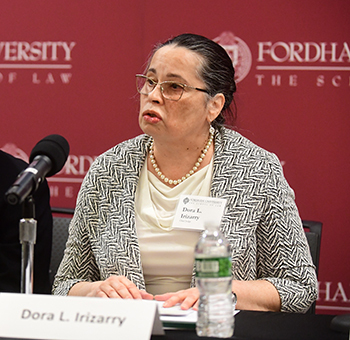 Later in the afternoon the judges participated in a town hall, at which Chief Judge Dora L. Irizarry began with a brief history of the court and outlined its jurisdiction and caseload. 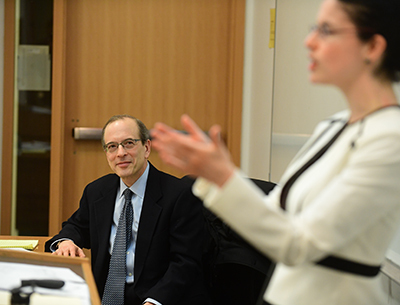 Judge Steven Gold visited Professor Janet Freilich’s Intellectual Property class. The Eastern District of New York was established in 1865 by President Abraham Lincoln following a period when the older Southern District of New York had become inundated with admiralty cases. To provide caseload relief to the SDNY, Congress and President Lincoln decided to split off some of its counties. Today the EDNY comprises five counties: Brooklyn, Queens, Staten Island, Nassau, and Suffolk. The court’s 28 district judges and 19 magistrate judges serve eight million people, making the EDNY one of the most diverse district courts in the United States. According to Chief Judge Irizarry, the court processes more naturalizations—around 60,000 each year—than any other court in the country, with the possible exception of the Central District of California. Following the chief judge’s opening remarks, Professor Daniel Capra, who organized the event with assistance from the Moot Court program and the Fordham Law Review, posed to the judges a number of questions that had been prepared by Fordham Law students. The judges spoke about the importance of attorney preparation, the issue of pro se litigants, the frequency of trial work versus number of judges, and the qualities that characterize an exemplary clerk. Professor Daniel Capra posed questions to the EDNY judges. In addition to judges Gold and Irizarry, other participating EDNY judges were Joseph F. Bianco, Lois Bloom, Pamela K. Chen, Brian M. Cogan, Ann M. Donnelly, Nicholas G. Garaufis, Edward R. Korman, James Orenstein, Ramon E. Reyes, Jr., and Eric N. Vitaliano.